In large bowl, combine courgette, grape tomatoes, red onion, garlic and rosemary. Drizzle vegetable mixture with balsamic vinegar and Wicklow Rapeseed Oil with Lemon. Toss, then sprinkle with salt and pepper. Spread vegetables in single layer on baking sheet and place 4 inches under grill for 10 minutes or until vegetables are tender crisp and browned. Halfway through cooking time, toss vegetables. While vegetables are cooking, prepare baking sheet with foil and Wicklow Rapeseed Oil. Place trout fillets on prepared baking sheet. Sprinkle both sides with pepper and place rosemary sprig under each fillet. Drizzle each fillet with 1/2 tsp Wicklow Rapeseed Oil with Lemon. Place fish under grill for 7 to 8 minutes or until fish is opaque and flaky. 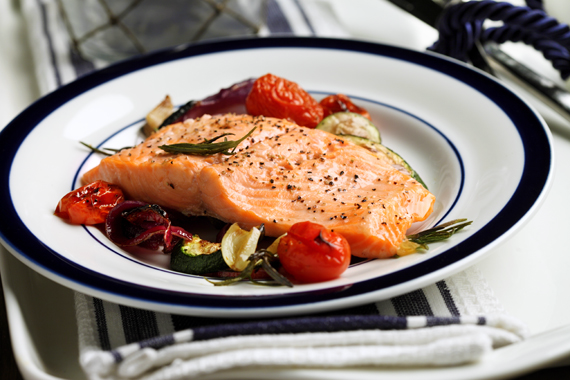 Carefully lift trout from baking sheet with spatula and serve with vegetables. © 2019 All Rights Reserved. Wicklow Rapeseed Oil.